To make sure that your account details are always secure, verification by email is an important step. Can I add multiple email addresses and mobile numbers to login to my account? To make sure that your account is always secure, multiple email addresses or mobile numbers cannot be added. For an account, only one mobile number & email ID can be used to login. How do I de-activate my account. Sorry! What happen? Please feel free to contact us for account deactivation. You are most welcome. Please feel free to contact us for account activation. Can Vivid Print use my account without my knowledge? Not at all! We ensure that you get a secure and safe shopping environment always. Simply contact us the friendly Vivid Print team to discuss your requirements. How do I place the printing order? Printing from us is easy! it’s easy! Just go to Account & click on the Order you want to see. Yes you can change your order before we sart printing. you can change the quantity, product, customization or any product configuration before we start printing. if printing strted then change of the order is not possible. To make speedy shipping normally we start our printing next day of your order confirmation. How Can I change the product? Please feel free to contact us for the product change if you deceide to change the product. Customer need to pay any extra price for the new product in case of any change in price. yes. You can make any changes to the design after placing the order before the printing start. We understand that in cases, you may want to alter the quantity of a product or configuration of product in your placed order. You may even require having your shipping address updated. These changes are allowed till we have begun processing your order. For such requests, please get in touch with Customer Care immediately along with your order number. How quickly can I get my order shipped? Orders will be print and shipped before the order lead time you see on the product page. Please let us know if need more speed on printing. No fear! The delivery of your order is automatically rescheduled on the next working day. Sorry, as per company policy, a package can’t be opened before delivery is accepted. But you can accept the package & get in touch with us later in case you have any concerns. On the rare occasion that your order is delayed, please check your email & messages for updates. A new delivery timeframe will be shared with you. You can also track its status by visiting My Orders. Sorry about this. Delivery time for an order cannot be changed yet. Sorry, this option is not available yet. We accept postpone of shipping by one week not more than that. I have a complaint about the courier guy who came to deliver my order. We’re sorry to hear that. Please let us know the details by contacting our Customer Support & we’ll look into this for you. Please check after 48 hours as the tracking ID for your order will take some time to be activated once it’s shipped. Your order was undelivered and Returned to Origin due to any of the followig reasons- Non-Serviceable Location / Incomplete Address / Wrong Pin Code / Consignee not available / Army area. In this case, you will not receive any refund; however, we will re-ship your order customer need to pay shipping charge for second time shipping. What should I do if my order and design is approved but not yet dispatched for a long time? A hard copy of the invoice is sent along with your order. We also attach a soft copy of the invoice to the delivery confirmation e-mail we send you. Invoices are available on the My Orders page if you need them later anytime. Can I cancel my order in Vivid Print? Sorry What happened? You can cancel your order before we start priting. Some cases we may collect matrial from third parties. in that cased order need to cancel before we collect matrial, we cannot return to it. so you cannot cancel your order. In order to get your order delivered to you soon, we start work on your orders on the same day. You can cancel your orders in case we didn't buy matrials for your order. Normally we collect/buy the matrials with in same day. You are requested to immediately email us/contact us for the cancellation of order. Your orders can also be cancelled if Vivid Print team finds your payments have not been received, Non receipt of Payment or any violation of terms and conditions- In case the payment for the order is not made. Non availability of product. An email notification is sent to you when we cancel the order. You can very well change your order before we start collect matrials. In terms change of order is allowed only quantity or Product configuration. No, You cannot return it. But if you identified before we start printing you can very well cancel it. if it's started then you cannot cancel the order. Sorry! 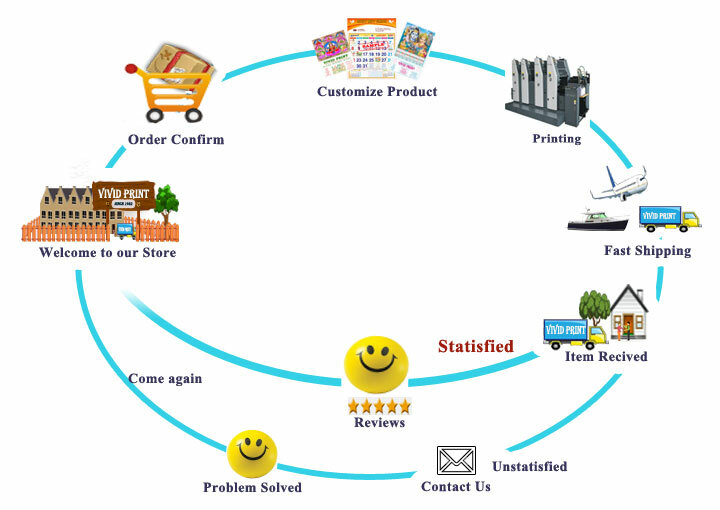 We at VividPrint.in slog it out to provide the best possible experience while you shop with us online. In case if you not statisfied with our please conatact us via email or call us. Customer is first we will try to resolve your issue as soon as possible. We try to solve your issue all the possible way but still once the goods are delivered we will not accept any return & replacement request for any reason. Will Vivid Print cancel my order? Very rare occasions. We will cancel the order if Vivid Print team finds your payments have not been received, Non receipt of Payment or any violation of terms and conditions- In case the payment for the order is not made. Non availability of product. How do I know my order is canceled? An email notification is sent to you when we cancel the order. Can I get the refund when Vivid Print cancel my order?. Yes, we will refund via same medium. How long will your refund really take in case of order canceled by vivid print? We will initiate the refund process immediately once your order has been canceled. Vivid Print offers an array of payment methods for Prepaid Orders. You may glance through the list below and choose to pay through your preferred medium. What currencies are avialble on vividprint.in? Currently we accespt only rupees. Can I buy a product at vividprint.in if I do not have a credit card? if you don’t have a payment card there are other payment methods available. Are the transactions completed on vividprint.in secure? We take great care in ensuring your safety during the payment process. Your payment details will be encrypted and sent using a secure connection therefore your transactions remain confidential. No unauthorized person can have access to those details. Vivid Print payment processing system is fully PCI DSS (Payment Card Industry Data Security Standard) compliant according to international security requirements. Can you accept the NEFT payments? Yes we accept the NEFT. Please contact us for NEFT payment details. Do you have EMI option? Sorry! we don't have EMI option from us. But you can avilal throught your Credit/Card. Please Select EMI option while pay through your credit Card. We don't charge any extra changes but be careful EMI option will have interest rate from your creadit card bank. Sorry! currently we don't have COD. Sorry! currently we don't have EMI Payment option. But you can avail from your Credit Card. Please check with your bank for EMI option and Rate of Interest. How will I know that my payment is completed? As soon as your payment is accepted you will be redirected back to the Vivid Print order confirmation page. However if you do not see confirmation page, Please check your email for order confirmation or payment confirmation mail, your order has been completed successfully but the confirmation page has failed to reach your browser. But still payment not completed. kindly follow the below steps to check all your orders and Payment status from vividprint.in. Click on Details for an order. If it is "Pending" then your payment transaction has failed. you will get the "Retry Payment" option. Click on "Retry Payment" to complete your order payment. Keep all your card details password and registered mobile to complete your payment process very fast. Please do not reload, refresh or use the back browser button while payment is in progress. Be informed that there is a certain time limit of 30 minutes to complete your payment. Please make sure there is sufficient funds and card limits for the transaction before making your purchase. Having difficulties with the online payment please contact us. That’s why we are here. If you are in any doubt or have any questions please contact us and we will be delighted to help you. Or, choose to email your artwrok when ordering and tell us in the email what you are unsure about and we will check it out for you. We're experts in all kind of printing, so you don't have to be! Be careful when using small font sizes. We don’t recommend smaller than 8pt for small format work up to A3 and 12pt for large format above A3. Remember, the smaller the text the harder to read. How I use Images for art work? All images should be 300 dpi. DPI is the amount of ink dots per inch; 300 dots per inch is the required standard for printed material. Images should also be placed at 100% size in your final document. For example, if your image is 50mm x 50mm at 300dpi, then it is also that size when placed in your document. Lower resolution compromises image quality and may result in pixilation (where the pixels, tiny squares or dots that make up the image, are apparent when printed). Please note that opening a 72 dpi image in Photoshop and simply changing the dpi to 300 will not increase the quality of the image. Avoid printed borders placed too close to the edge of a page as they may look uneven when the job is trimmed. Can you print jobs that are different than the standard products that you offer? Yes. We do all kind of Printing. We request you do a quote on any job that doesn't fit our standard products. What kind of paper will my order be printed on? Please check or choose carefully on product details page. How well will my printing finished product match what I see on my monitor? Most people are surprised at how well their job matches what they see. But because of wide differences in monitor calibration and the different technologies used, some printed colors may not exactly match the colors on your specific monitor. Please see our RGB - CMYK Information for important instructions on getting the results you want. How long does it take for me to get the proof of my printing job? You receive throught an email.